What type of backing does the carpet have? All custom molded carpets on our website are priced to be made with Poly Back carpeting. This is the same carpet backing that is offered by all discount auto carpet retailers in the aftermarket industry. Poly Back carpet is a more economical option and is the most common option for aftermarket carpet. Stock Interiors also offers a Mass Back upgrade for most carpets, which will provide a heavier, more rigid backing. Please note that the type of backing you chose does not affect the quality of the carpet, nor does it affect the way that the carpet will fit your car. 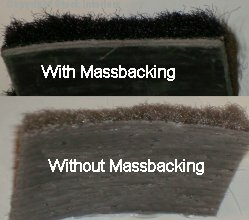 Our Mass Back is made of 40mil thick Ethylene vinyl acetate which gives the carpet a dense rubber backing to reduce heat and noise within your vehicle. The Mass Back is aplpied to the back of the carpet and then molded to the correct shape. This Mass Back carpet more closely duplicates the original factory materials for many later model OEM carpets. Because this is an upgraded product, there is a surcharge for this backing, as well as additional shipping costs. In most cases jute padding will be included with the carpet, and may or may not be attached to the bottom of the carpet made with Mass Back, depending on the application. Most items listed will specify these details, or you can contact us for more information. Our Poly Back carpet, also known as polyethylene backing is an economical replacement option, with a jute padding bonded to the bottom for comfort. The Poly Back carpet is made with the same quality carpet fibers, but will have a 1/16th inch plastic, more flexible backing than the Mass Backing. Please note that the fit of the Poly back carpet is the same as the mass back carpet. If you are searching for a replacement carpet with the rigid rubber backing, then be careful when searching on other websites. Most websites make claims of using "OEM" materials, but most do not offer a Mass Back option. Our Mass Back upgrade will give you the quality and satisfaction that you are looking for!